Getting together to read, talk and think about our contemporary constellation and potential practices that might constitute new forms of life. The TMBR Reading Group will focus on on the 21st century critical theory from a wide range of disciplines and with a broad interpretational framework. The reading group is not an endeavor of specialist or insiders, everybody brings the knowledge and experience they have to the table and we will work towards a shared, although not neccesarily consensual, interpretation of the texts. What we read and how we read can be discussed and reevaluated together at anytime. 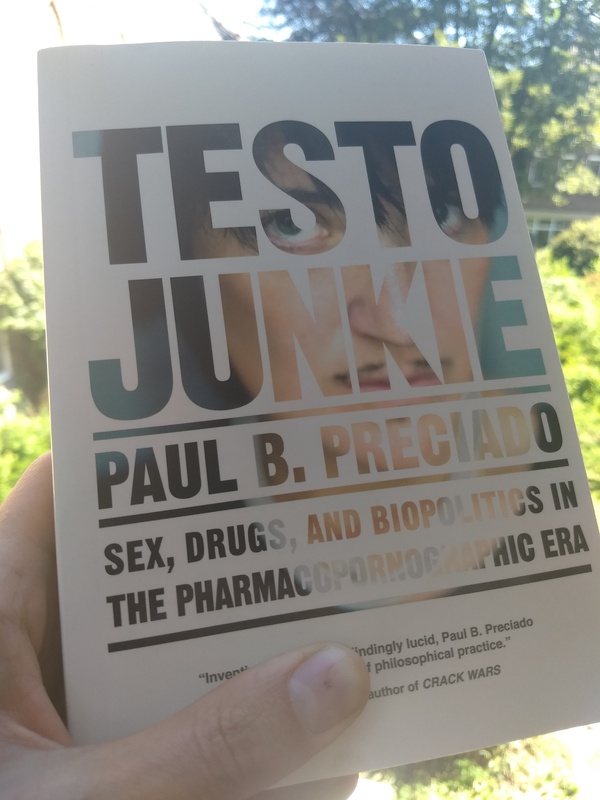 The proposal for the following sessions is to read Testo Junkie by Paul B. Preciado. We read a chapter before a session, in order to discuss and reread parts of the chapter together during the session. TMBR Reading Group will take place with a pot of stimulating coffee and energizing tea. Sunday afternoon from 12h till 14h. in the collective session we can (re)read and discuss Chapter 12 – Technogender. (If you missed out on reading before you might want to read the Introduction, Chapter 2 – The Pharmacopornographic Era, Chapter 4 – History of Technosexuality, Chapter 6– Technogender, Chapter 8 – Pharmacopower, Chapter 10 – Pornpower). in the collective session we can (re)read and discuss one of the chapters. (If you missed out on reading before you might want to read the Introduction, Chapter 2 – The Pharmacopornographic Era, Chapter 4 – History of Technosexuality, Chapter 6– Technogender, Chapter 8 – Pharmacopower). (If you missed out on reading before you might want to read the Introduction, Chapter 2 – The Pharmacopornographic Era and Chapter 4 – History of Technosexuality). in the collective session we can (re)read and discuss Chapter 4 – History of Technosexuality. (If you missed out on reading before you might want to read the Introduction and Chapter 2 – The Pharmacopornographic Era). in the collective session we will discuss and reread the chapter. in the collective session we can read the first chapter Your Death (p.15-22) together. Afterwards we can discuss the format of the reading group and the best time to meet for the coming sessions.